"What, indeed, have we to declare...?" Okay, so far you may be thinking, all Christian groups say that worship is central. So what's different enough to justify our separate existence (in Dunstan's words)? Hmmm. Perhaps it's not what is different enough just now -- but what should be. I think Quakerism has one of the most winsome invitations ever to offer to people. The heart of Quaker worship is gathering to meet God. The distinctive of the Quaker message of worship is that we are not inviting you to come hear a specialist speak about God, another person read a book about God, others sing some songs about God, but rather to come and experience God. We come to meet God. To encounter the Divine. Not just to be told about the Divine through story, sermon, song, and silence, but to actually gaze into the face of our loving God and listen for God's words to our souls. Could there be a better invitation than that? At least, in my opinion, that's what worship should be -- about participatory listening to/for God. That would be distinctive from the Catholic tradition or the Methodists or the mega-church. Instead, I fear(and confess to having participated in), we are maintaining a Quaker worship pattern among programmed traditions (I will speak about unprogrammed later)that leads to a worship service (I use that word intentionally) that is a pale imitation of other Protestant traditions. The service is outlined in a bulletin and is centered, like a Protestant service, primarily on the sermon -- the proclamation of the Word. Now this is fine, I suppose, but is it enough, in Dunstan's words to "...justify our separate existence..."? Drop the name Friends from the front of the building and maybe it is. But I don't think so. I think all this bulletin making and worship planning takes us away from the central call of Friends to invite others to come and hear that Voice that will say to them "There is one, even Christ Jesus, that can speak to thy condition..." When they hear that, their hearts and souls will leap for joy. So, part four of my modest proposal, is to scrap the bulletin and the worship planning. Ditch them completely. And trust the Spirit to lead worship. If George Fox was right (and all us various branches of the Quaker tree claim him) then Christ is our present teacher. Let's let Him teach. "Let us let go and let God" as my Evangelical Friends pastor J. Earl Geil often said in many of the sermons I heard as a teen (about the only thing I remember specifically, him saying). Now, for the programmed folk who (like me often) enjoy singing, hearing a choir, a sermon, etc, I have not said to scrap those things. Necessarily. I am saying scrap the programming part. Instead of fitting holy silence in, use it as the basis for worship. Then trust God to lead the choir to stand and share musically. And move the pastor to give a prepared sermon. And for someone (even a kid!) to suggest singing a hymn. And for a time of prayer for those in need. And times of vocal ministry from the various folks whom God has gathered that particular day. Have hymn or song books in the pews/benches -- along with Bibles. And, instead of a bulletin with an outlined program, have one that contains a brief description of what Quaker worship is and how it will be planned by God, which may make it look unplanned to us. Until the Spirit brings it together. That would be the kind of Meeting for Worship that would justify our separate existence! It would be experiential, spiritually experimental, and Spirit-led. That would mean we would serve as a place where we can invite people encounter God and other like-hearted people. People searching for the sacred. Some having found more than others, some of us just learning the way or beginning to think about the Divine seriously. I say like-hearted, notice, and not like-minded. We don't all have to think alike -- which is a good thing, since few of us do. Sometimes I'm of two minds about things all on my own! To unprogrammed Friends, I would say, "Don't gloat." Yes, you may not have to discard some of the obvious trappings that we programmed folks do, but there are some that, while perhaps more subtle, can be just as inhibiting. One thing that can be inhibiting is the idea that the silence is sacrosanct to the point where we worship silence not worship in the silence. Unprogrammed Friends need to create a sense of hospitality in the silence and a feeling that "anything, God willing, can happen." Including -- gasp -- congregational singing in worship. Yes, that's theoretically possible, but how often does it happen? And are there items there to encourage it -- songbooks on the benches instead of a table in the corner? Bibles on the benches? Encouragement from the clerk that all -- young and old -- are invited to speak the words God brings to them. Indeed, I would maintain, based on my experience of unprogrammed worship (which is not a slim as some folks might think for a fellow who grew up a "pastorized" Friend) is that it can be, in its worst form, as rigidly programmed as a programmed meeting. The order of service is just implied and/or understood by the insiders. And any outsiders or visitors keep to their benches because they are afraid of making any kind of Friendly faux pas -- like kneeling or standing at the wrong time in a Catholic mass. Friend Thomas Green said, "Worship is essentially an act of adoration, adoration of the one true God in whom we live and move and have our being. Forgetting our little selves, our petty ambitions, our puny triumphs, our foolish cares and fretful anxieties, we reach out towards the beauty and majesty of God. The religious life is not a dull, grim drive towards moral virtues, but a response to a vision of greatness." Our worship must facilitate this response to a vision of greatness and invite people into experiencing the presence of God. So, humbly (and I mean that sincerely) let's let go and let God lead worship. Bye-bye bulletin. So long planned worship service. Hello fresh movements of the Spirit. 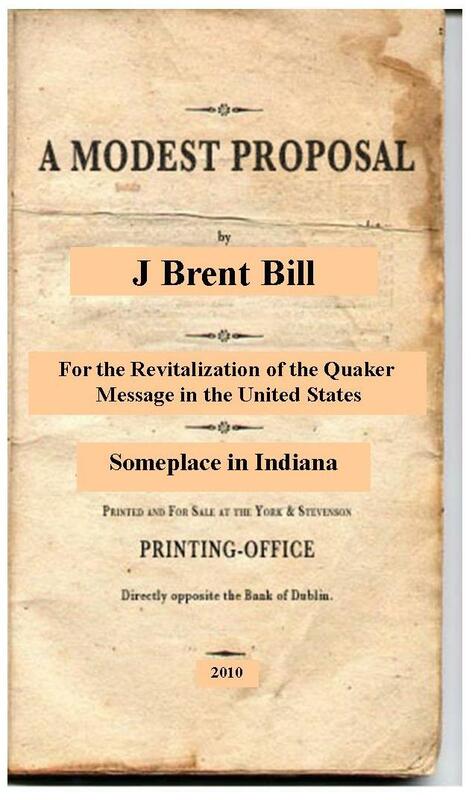 That's part four of my "Modest Proposal for the Revitalization of the Quaker Message in the United States." Thankyou for your comments re: unprogrammed worship. The ritualistic silence can be suffocating! I wonder sometimes as I sit there if we are remaining silent because we fear that if we speak we would find out how differently we each understand our faith tradition. So we remain paralyzed in a kind of pseudo-community that bends over backward to not be too assertive regarding our own beliefs (lest we find out that *gasp* others believe differently! ), and focuses on action rather that the basis of faith that such action should rightfully spring from. In such a silence I sometimes feel less "gathered" than when I'm in a maddening crowd! Brent, I appreciate this. I am thinking about the programming part. Besides the embedded expectations that are difficult to overturn within the culture of a meeting, I find that there are certain assumptions, etc. outside the meeting as well. We have had a number of people come and go because our programmed service already seemed far to casual and "unprogrammed." But let me be clear, it is not unprogrammed. We have the play by play bulletin, we have responsive readings, a planned sermon, etc. but the way we pull it off is rather informal. People visiting find this, sometimes, to be refreshing, and sometimes to be pretty annoying. I find this a difficult bridge to gap. I try, as the primary person planning the service, to mix things up regularly according to how I feel led, or what seems appropriate for that week. And we try to couch everything in an understanding that worship is participation with the Spirit of God. But this doesn't prepare visitors for that kind of worship. What I hear from you, I think, is partially that we really need to be unprogrammed, even if we are programmed, which I support, but also that we need a new way of describing what happens and why our worship is different? This is connected to being clear about what we are doing and why we do it that way. It will be hard for some people, but they'll like it, and other people won't like it at all, and that's fine - THEY CAN FIND SOMETHING ELSE SOMEWHERE ELSE. Really. This is one of the amazing benefits of freedom of religion. Not everybody has to like what we're doing. The point is that we are called to be the Quakers, not the pseudo-Presbyterians. In my unprogrammed meeting, we need to figure out how to get the Bibles and hymn books in among the people, since we don't have benches or chairs with the racks on the back to put them in. A few months ago, I sent my younger son to go get me a hymnal in the middle of worship, but it would have been better to have one within arm's reach. I think that moving to an unprogrammed programmed (sounds like an oxymoron doesn't it?) would be a real challenge for many meetings/churches. Hence the satirical titel -- a "modest" proposal. It would call many congregations to a completely new way of thinking about worship -- why we do and how we do it. A discussion which I think would be valuable just for having it. I don't think it could be driven by one person or small group either. I think it would have to be arrived at by a sense of the meeting. But I do think that, if presented as a way to be faithful to the call that God has given us to be Friends of Jesus and attract others who long to hear the voice of the Spirit, then it has potential for excitement and renewal. Again, not necessarily of instituional Quakerism, but of the sharing of our message. For some of the folks, who are fearful of change but also fearful of decline (and see the eventual closing the doors), I suppose it could be positioned as "what have we got to lose?" Which is an ironic question to me -- what have we got to lose by being obedient to the Spirit? Everything and nothing, I think is the answer to that. And I think there are ways to do involvement of kids in worship -- to help them sense the Spirit moving. It may be as simple as asking them, as a family prepares for Meeting, if they have a song they'd like to sing in worship, or a Bible story they like, or something special that happened to them. And then encourage them to "listen" with their hearts for the right time to share that. Tell them that God will let them know "when." A practical listening for God. I need to speak up in defense of the Catholic worship of my youth, My experience is that it is the closest thing to Quaker worship, at least inwardly that I have come across; this inward similarity was recognizable to me from the get-go. In my church wanderings, the other "Protestant" services seemed to be mainly "about" God, and the absence made me wonder why they bothered. There's another part of this, which is maybe not so easy to grasp: Both also managed the work of routinizing this divine manifestation. I often hear descriptions of the sense of the presence of the divine in highly emotional terms, of ecstasy or throes of judgment or visions etc. All of which happen; but for me, and I suspect for most of us, they are not the First Day norm. More typical is a worship experience that can often be ordinary, distracted,and even dull: for instance, I don't think I ever heard a really memorable sermon in all my Catholic years; and in truth, a great many messages in meeting come across as mundane, predictable or worse. But in the Catholic belief world, none of that matters: God is present also in the ordinary, the mundane, and the dull. And I think that is also the case in a Friends meeting. Anyway, I haven't the slightest urge to return to the Roman fold; but one reason for that is because much of the best of it is also found in my Meetings, paradoxically at their most undistinguished. Brent, I say, take it a step further! Unprogrammed, waiting worship (I personally prefer 'waiting' to 'silent') are built on the testimony of simplicity: strip away outward forms without power, removing anything that might get in the way of hearing and feeling the presence of God. Traditionally, the primary vehicle for that communion, though not the only one, is vocal ministry. Programmed worship and 'pastoralized' meeting life tend to block God's access both to the gathered community and to the waiting (potential) ministers. In programmed worship, God must hitch a ride on one of the forms in the service or bypass them and compete with them on the way directly to the human heart. Pastoral meeting life tends to distract non-pastors into thinking the ministry is already covered by somebody else, to turn the rest of the meeting into spiritual consumers rather than producers, to deny God and the meeting all the other voices and minds and hands that God might use. I say "tends". But it's a strong tendency, as I've observed it. For I believe that this is what we have to declare that is distinctive: that we are all called to be ministers and that the traditional faith and practice of Quaker ministry is a sublime and time-tested spirituality that not only serves God's people but also fulfills the called minister in ways no other community enjoys. Our message: that we are each called to direct communion with God, that the meeting is called to direct communion with God, that God is always renewing God's revelation through God's ministry, and that we are called to live the truth we are always receiving in our lives—all this requires the discipline of simplicity. To strip away the obstacles to hearing the call and answering the call, to discerning the call and living the call. Program and professionals tend to get in the way, and worse, to present themselves as the way. That is, they tend toward idolatry. I'm not exactly sure why Chuck feels it necessary to "speak to the defense" of the Catholic experience of his youth. I truly hope it wasn't anything I said or implied. Indeed, I would agree w/ church that there is much in common between the (especially intent) Catholic and Quaker worship experiences. Both, in my experience, are about the congregants experiencing the Real Presence of Christ -- albeit differing in methodology. In fact, my book Holy Silence originally was titled "Sacramental Silence" -- but that was nixed by the publisher for reasons that don't matter here. Suffice it to say that I have deep respect for Catholic spirituality -- and Christian spirituality. The point I am striving for in these posts is that, though, they are not Quaker and we are not them. So we need to claim that which is ours and so structure worship that fits that. I am not at all as certain that waiting worship as practiced among some Friends is any more conducive or inhibiting that programmed worship is. I think it can be just as deadly. Especially if we take silence to be the norm instead of the medium through which we experience God. Singing and other worshipful activities can lead us into the presence -- in the same way that the procession, et al in the Catholic church do ... preparing us for a deep experience of the Real Presence. My proposal in changing worship especially is not geared toward making it more interesting for those attending. It's to make those attending more prepared and/or ready to encounter the Divine. It's to make it more participatory -- so that we see that we are each responsible for Meeting for Worship. That when we all come prepared to participate, we are all blessed in amazing and maybe even unexpected ways. I think the key is that we each/all need some time for listening to God and some time for teaching/discussing/singing together. An unprogrammed meeting with no collective religious education becomes dry and dull. A programmed church with no time for collective listening to God becomes rote and dependent on a few leaders. A vital Quaker meeting needs both. Brent, I'm just catching up with your series and it's great so far! Thanks for your thought-provoking questions and suggestions. I'm from a programmed Yearly Meeting but I've attended unprogrammed meetings for years at a time at various points. I've also been to seminary, so done some major work in thinking about and learning how to program a worship "service." In some ways I like unprogrammed worship better, but there are also things about programmed worship--done well--that I appreciate. I wrote a comment but Blogger says it's too long! So I'll post it on my blog.